Turn over a rock or log, and you'll see dark, shiny beetles running for cover—ground beetles. This diverse group of predators are among the top 10 beneficial garden insects. Though hidden by day, at night the Carabids hunt and feed on some of our worst garden pests. Most ground beetles are black and shiny, though some display metallic colors. In many Carabids, the elytra are grooved. Look at a ground beetle's hind legs, and you'll notice the first leg segments (the hips) extend backward over the first abdominal segment. Threadlike antennae emerge from between the eyes and the jaws of the ground beetle. The pronotum is always wider than the area of the head where the eyes are present. Nearly all ground beetles prey on other invertebrates. Some Carabids are specialized predators, feeding exclusively on one type of prey. A few ground beetles feed on plants or seeds, and others are omnivores. Like all beetles, Carabids undergo complete metamorphosis with four stages of development: egg, larva, pupa, and adult. The entire cycle, from egg to reaching reproductivity, takes a full year in most species. 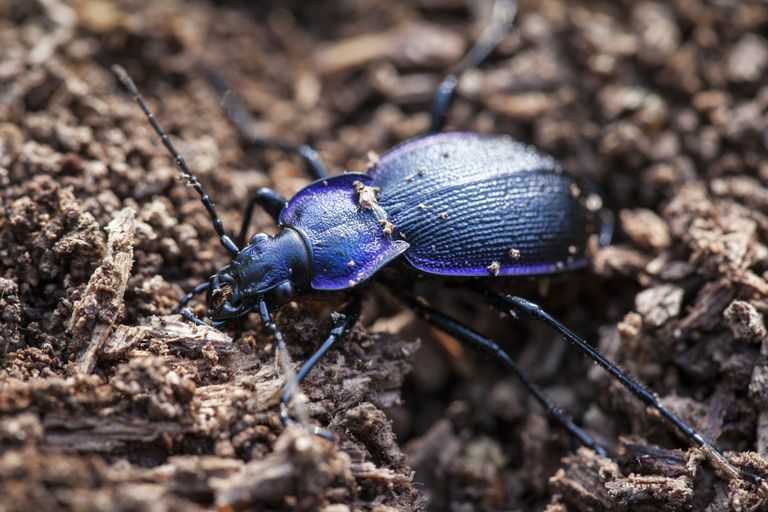 Ground beetles usually lay their eggs on the surface of the soil or cover their eggs with soil. In general, eggs take up to a week to hatch. Larvae go through 2-4 instars before reaching the pupal stage. Ground beetles which breed in the spring typically overwinter as adults. Carabids that breed during the summer months tend to overwinter as larvae, then finish their development to adults in the spring. Many ground beetles employ chemical defense systems to fend off attackers. When handled or threatened, they use abdominal glands to produce pungent odors. Some, like the bombardier beetles, can even make chemical compounds that burn on contact. Ground beetles live in almost every terrestrial habitat on earth. Worldwide, about 40,000 species in the family Carabidae have been described and named. In North America, the ground beetles number well over 2,000.